Is the Labor Force Running Out of Labor? | Challenger, Gray & Christmas, Inc.
On the surface, some of the recent economic data might look like the recovery is stalling, but the trends, in fact, may be the result of the shrinking pool of available talent. The Bureau of Labor Statistics monthly employment situation report was received with much trepidation, as job creation slowed to just 38,000 new jobs on employer payrolls. However, as pointed out by Bloomberg News (http://www.bloomberg.com/news/articles/2016-06-08/has-america-run-out-of...), many economists are worried that the decline in hiring could be due a widening gap between the number of job openings and the number of people who are qualified and/or willing to fill them. 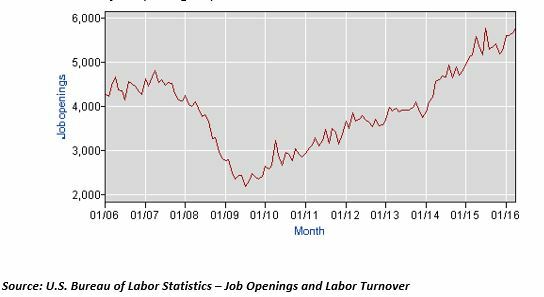 Indeed, the number of job openings does not appear to be shrinking. At the end of April, there were 5.8 million job openings, up from 5.7 million a month earlier. The latest report that could be mistaken as a sign of economic sluggishness is Friday’s Commerce Department reading on monthly housing starts which showed a 0.3 percent decline in May. Once, again though, that slowdown, may be related to the unavailability of skilled workers. The Colorado Springs Gazette reports that development in the area is being hindered by a lack of qualified workers. More and more cities are joining Colorado Springs (http://gazette.com/construction-labor-shortage-stymies-colorado-springs-...) when it comes to shrinking labor pools. A Labor Department report, also issued on Friday, indicated that 16 states had unemployment rates well below the national average of 4.7 percent. As of April, there were 67 metropolitan areas with an unemployment rate of 3.5 percent or lower. The issue isn’t simply the number of unemployed Americans, of which there are still more than 7.4 million, not including the 5.9 million Americans who are not in the labor force but still want a job. The problem is that the available workers are not matching up with the available jobs. A number of factors are likely contributing to the mismatch, including workers not having the right skills or being in the wrong place, geographically. It could also be that available workers are not finding the job openings for which they are qualified. As the economy continues to expand, the labor shortage will worsen, particularly in light of the fact that aging baby boomers are leaving the workforce in droves. While a record number of Americans 65 and older remain employed, the number of those in this age group leaving the labor force is growing rapidly. The number of Americans 16 to 64 not in the labor force increased by 571,000 between May 2015 and May 2016. Meanwhile, the number of Americans 65 and older leaving the labor force increased by nearly 1.1 million during the same period. Not only will the exodus of boomers mean fewer bodies in the workforce, but employers are losing a significant amount of people with valuable skills, experience and institutional knowledge that are difficult to replace. The absence of these workers will be especially glaring in skilled manufacturing, skilled trades, construction and specialty crafts, which have struggled to attract younger generations of workers to replace those retiring. Last year, the National Association of Home Builders said that the shortage of workers in the nine trades required in homebuilding (e.g., concrete pouring, carpentry, electrical, etc.) was substantially higher than it was during the 2004-2005 boom, despite the fact that the 2015 building pace was half that of the peak. A 2015 study by Deloitte for the Manufacturing Institute found that not only is there a current shortage of manufacturing jobs, but between a skill shortage and the replacement of retirees, over two million jobs will go unfilled over the next decade because there aren’t enough qualified Americans who want these jobs.